One of the stumbling blocks to getting faculty to rethink the use of computing technology in the classroom has been the persistence of the “myth of the digital native.” Too many faculty assume that students are somehow naturally adept at the use of computing technologies and the internet by right of birth within the past twenty years or so. As such, they fail to recognize a need to integrate computing skills into their teaching. Eszter Hargittai’s research at Northwestern University over the past few years has shown this assumption to be false. Instead, it finds that “even when controlled for basic Internet access, among a group of young adults, socioeconomic status is an important predictor of how people are incorporating the Web into their everyday lives with those from more privileged backgrounds using it in more informed ways for a larger number of activities.” Such findings suggest that students do not enter the classroom with innate and uniform computing abilities. Rather than relying on the tired stereotype of “digital natives” faculty should be thinking about ways to integrate computing technologies and the internet into scholarship and learning as way to provide students with a broader range of the computing skills. Two comments: one, computer technology (particularly smartphones and wifi) has changed enormously since 1995 — and its use has been geared to social needs rather than learning. We may need to rethink learning as social endeavour, (rather than a group of individuals) to properly capture that energy and potential. Two: I would like to hear more success stories of integrating digital with learning practices! Sean, what works for you? First, I agree with your statement about rethinking learning as a social endeavour. I think there are a lot of lessons from online social networking and community development that we can apply to the integration of web technologies in the classroom. For example, I try to set up my course websites (we use Moodle at York) as hubs where students can interact with one another outside of class time. This is especially valuable in large courses where students may only have direct interaction with classmates in their smaller tutorials. The course website allows students to potentially interact with everyone in the class. This kind of use of web technologies in teaching is not new. What I try to do is to foster online discussion like a community manager would on a website. One of the problems with course websites is that they often feel like empty, dead spaces online. It’s up to the instructors, I think, to be in there and to respond to student comments and questions in a timely fashion. This is something I learned with I taught an online environmental history course years ago. I think we sometimes assume that students will develop their own online communities through a course website organically. While this happens sometimes, anyone who has used an online forum knows that the best communities on the internet are served by thoughtful community managers and moderators. Second, I also agree that smartphones and wireless networking (WiFi and mobile data) have changed the equation for computing in the classroom. I definitely noticed this in the articles that I pulled up for this post. Around 1999/2000, faculty began to write about wireless networking as the next frontier for classroom computing. There were a lot of optimistic articles about how university campuses would be able to have computer labs outside. Very soon, however, the tone of the writing shifted toward calls for laptop and internet bans in the classroom. Your point still stands. Wireless networking combined with portable computing present a whole different set of challenges for university educators. Banning wireless networks, however, is a losing gambit. Turning off WiFi in the classroom will become a completely obsolete tactic (if it hasn’t already) as more students gain access to high-speed mobile networks. Up until recently, the WiFi network at York was slower than an HSPA+ mobile data connection and certainly slower than an LTE network. I often preferred to use my mobile data over the campus WiFi prior to its recent upgrade. I TAed a course that required students to bring their laptops to tutorials, which I found had the unintended consequence of “outing” those students who don’t have their own computers or, at least, their own laptops. Rather than integrating computers into the class, it served to mark out those from less privileged backgrounds who may be struggling to meet tuition, rent, and other expenses, creating unintentional awkwardness in tutorial sessions. To get around this, I searched out the closest computer labs and ensured there was at least public access to them during class time so those students wouldn’t be left out–though they definitely lost the experience of working together with their peer groups (small group activities, sometimes with online components, was central to the tutorials). While this may be less prevalent in today’s classroom than it was when I started my university career in the early 2000s, it’s important to remember Tom Peace’s point from about a year ago about the barriers to access that a reliance on the digital can unintentionally create: http://activehistory.ca/2013/07/digital-history-isnt-for-everyone/ In my case, in 2013 and 2014 I had a handful of students without access to a machine they could bring to class. I wouldn’t ban laptops (though I have let students know that browsing social media won’t help their participation grade), but I also think it’s important to be aware of what going all the way in the opposite direction by mandating them could and does mean for some students. Is scale a factor? 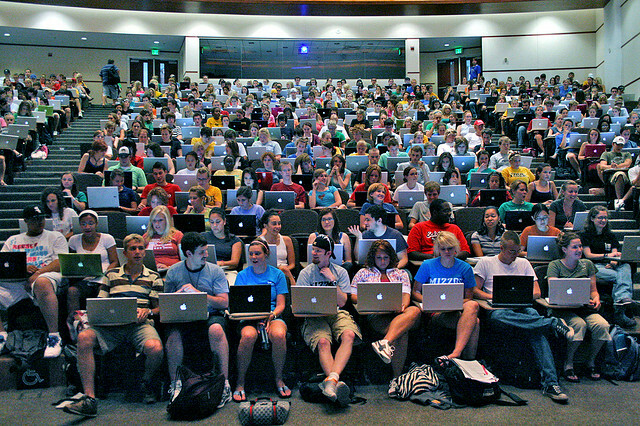 Getting 400 people to do anything – with or without laptops – is a near impossibility. Integrating instruction (and hopefully discussion) about digital tools into a course with 15 or 25 students seems much more plausible. I’ve had similar conversations with others about the affordability issue when it comes to the integration of computing into the classroom. This was a primary concern of faculty and students in the 1990s when some universities started to introduce laptop programs. While I agree that the use of computers in the classroom has the potential of raising issues of equitable access to education (tuition, of course, is the far greater issue), I think the precipitous drop in the cost of mobile computing can help overcome this challenge. I think our concerns about the affordability of mobile computing might be based on false assumptions about computing costs. I came to this realization when I bought a laptop that cost less than my introductory biology textbook from years ago. While laptop computers may have been premium luxury consumer goods in the early 2000s, the rapid drop in prices has brought computing within reach of a broader range of students. This is all the more important given that “analog” options for completing coursework in a humanities education simply no longer exist. Research and writing in history courses went digital long ago. Analysis of research findings increasingly depend on digital tools (GIS, text mining, etc…). With cheaper mobile computing, we now have the opportunity to teach digital research, analysis, and writing skills in our classrooms instead of assuming that our students will pick up these skills somewhere else. I think your solution of using campus computer labs is terrific. You could also design computing activities that can be done at home (for students who use desktop or family laptops in the home). I end up designing activities where students can share available laptops or tablets. And in the past couple of years, I’ve tried to develop exercises that can be done on a smartphone or any other web-connected device. Most of the uses of computers in humanities education do not require high-capacity computing. I think a good teaching computer lab is far more preferable to a classroom with a random set of laptops. My dream seminar room has a teaching computer lab on one side and a conference table for discussion and group work on the other. I’d love to see a physical teaching space that facilitates both the use of computing technologies and student-student/student-teacher interaction. Ah… to dream. Scale is absolutely a factor. Just as we tend not to try to facilitate discussion tutorials of 400 students, we wouldn’t design activities that integrate computing that are not appropriate to the class size. I see possibilities for the integration of computing and the internet in both large and small classes. I have found tool-based workshops work best with smaller classes (tutorials and upper-level seminars) and broad online communication activities work well in large classes (online forum discussions, Twitter sharing). When we do get around to writing up a few posts on activities that integrate computing and the internet into teaching, we should definitely keep scale in mind. The use of computers in teaching and the use of laptops in the classroom seem to me as two different, although related, issues. Yes, we should strive to incorporate new technologies into the way we teach and to train students to use those technologies. But the main criticisms of laptops in the classroom is that laptop use tempts students with easy distraction, that transcription is a less effective form of learning than note-taking, and that students distracting themselves often inadvertently distract others. Banning laptops might seem to be micromanaging student learning, to force them to be engaged, but many professors still become irritated if students come in late, leave early, or sleep in class. That said I’m curious to hear about what possibilities people see for in-classroom computing in history courses (although I have to agree- based on conversations with students in my classes and tutorials – that even at current pricing there remain very real barriers to access). There was some discussion on Twitter today about writing some posts with examples of activities that incorporate computing into history teaching. I’ll be writing one of the posts and there were others interested in submitting their own suggestions. Yesterday I received a lot of feedback on this article outside of this comment thread and I just wanted to acknowledge and respond to that feedback here. One reader pointed out a very important flaw in my article (among many, of course) that I wanted to address. I should have added a caveat that the prohibition or regulation of computers and the internet in the classroom does not necessarily imply that the instructor is ignoring the integration of technology into her/his teaching. There are certainly many faculty who prohibit laptops while also using digital technologies in their teaching. 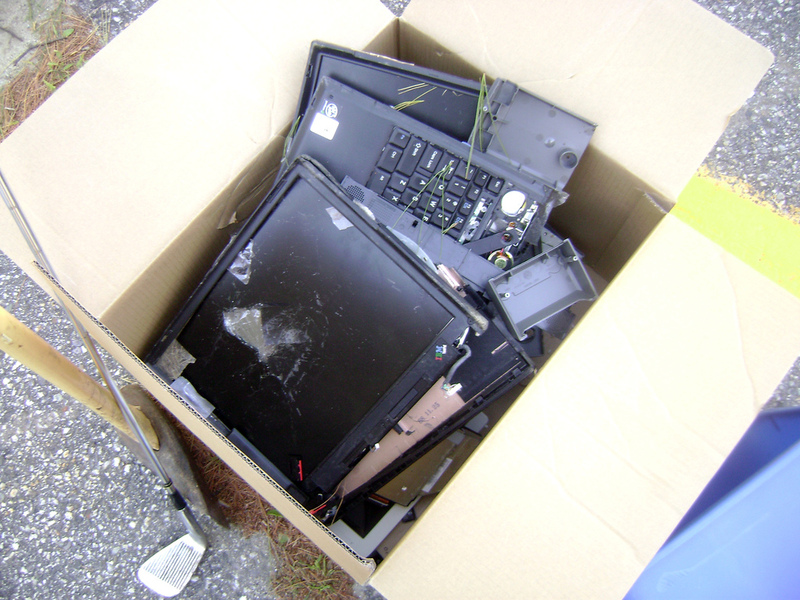 While I do not agree with the policy of laptop bans, I should have acknowledged the great variety of types and purposes of laptop regulations in the classroom. And I certainly did not intend to imply that all faculty who set restrictions on the use of computers in the classroom lacked innovation and creativity in their teaching. This is obviously not true. While these instructors may be the exception, I still believe many university instructors have an impulse to restrict computer use in the classroom in order to preserve older teaching methods and avoid addressing the impact of computing and the internet on higher education. This was the issue I was trying to address with this article. Echoing Adam Chapnick’s comment on Sean’s website, I think it is really important to not force learning disabled students to publicly identify themselves as the only students allowed to use a laptop in a classroom. At this point in my life I’m happy for people to know I’m dyslexic, but at 19 I was happy to have some privacy. Hey Sean – Nice, thoughtful post. I’m glad you added the later update about faculty who might like to ban laptops/smartphones from some parts of the classroom but otherwise use digital technologies in the teaching. This certainly is how I feel. I’m not hostile to technology and like to use it in my teaching. But, as with everything, there is a time and a place. When the job is to listen and take notes, then technology is a distraction. When the job is to talk, technology is a distraction. I organized Trent’ big first year class recently, and regularly sat at the back of the lecture hall as my colleagues lectured. At every lecture, the students at the front on laptops were taking notes and this became progressively less so the further back in the lecture hall you went, to the point where at the back, almost no one was taking notes. Plenty of Facebook, scanning iPhoto, video games, etc. Now, these were lectures pure and simple – some were exceptional and done by great award winning teachers. They didn’t incorporate interactive activities into the lectures. So there was no chance to test out what might happen in that context. But, as it was, the laptops were clearly a distraction for many. Perhaps the same students at the back wouldn’t have been paying attention even without laptops. Perhaps they’d have been dozing or daydreaming. That’s possible. This is where some nice standardized, evidence-based, control group research would come in handy. But your main point, which is I think about the need for faculty to themselves take the initiative and get to work rethinking their teaching methods to figure out how to rework technology into their own teaching, is a good one. I’ll look forward to future posts on what people have done. I assume much the same happens in the back rows of my own classroom. I also assume, as you note, that students who aren’t interested in my lectures would find other ways to get distracted without laptops. I will be putting together a future post on techniques and strategies that take advantage of Internet-connected laptops in the classroom. It will be posted here or on the NiCHE website or on my website. I’ll post the link to Twitter (but don’t check it during lecture! ).